Opportunities abound for certified socially and economically disadvantaged small businesses! Government agencies and community organizations have what are called set-asides - contracts that are earmarked to be fulfilled by small businesses that are economically disadvantaged (with a net worth of less than $750K) and /or owned and managed by a member of a social-disadvantaged group such as a minority, woman or veteran. Prime government contractors are always looking to fulfill their Small Business Participation requirements by subcontracting work to top-performing small businesses with 8a certification. Does Your Business Qualify for the 8a Business Development Program? Get ready to be certified. A lot of people don't realize the application process to participate in the 8a program is different from applications for other certification programs that people typically lump-together with the 8a. 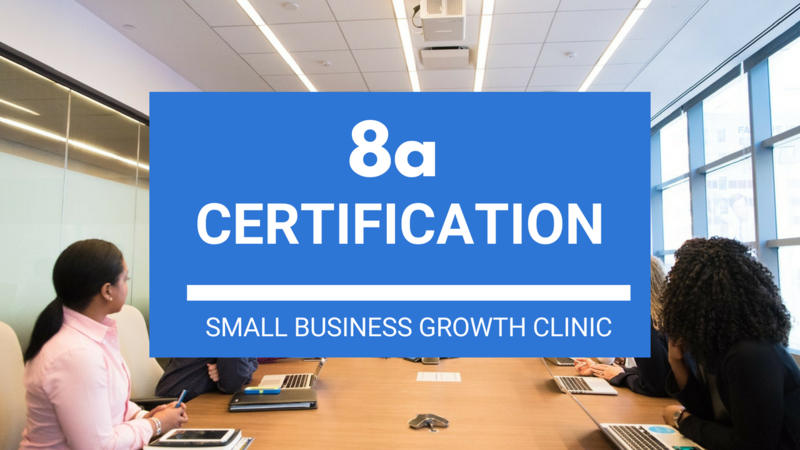 So, the 8a Small Business Certification Clinic is a start-to-finish 8a certification prep program for small businesses that meet the above eligibility requirements. During this one-day live training, you will: You will need to have access to your corporate documents for this training. Keep an eye on your inbox to find out when the next 8a Certification Clinic will be.